Successfully saved Banana Oatmeal Chocolate Chip Cookie Bars to your Calendar. You can also save the ingredients to your Grocery List. 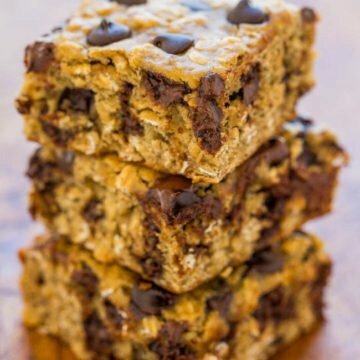 Banana Oatmeal Chocolate Chip Cookie Bars – A FAST and EASY dessert that is on the HEALTHIER side with only 1/4 cup butter and no oil!! Bold banana flavor, chewiness from the oats, and plenty of chocolate in every bite! !